Mr.Buxton enters the Comme Des Garcons headquarter bringing a case containing a "prototype" of CDG2MAN. He has a meeting with the art directors at the marketing department. He sits at the round table, opens the case and shows the guys his work. - this is almost perfect and we would like to keep the finished product as close as possible to this sample but what about turning the general campfire vibe into something more waxy? I'd like CDG2MAN to have a waxy feel to it, like a burning candle...I love the church-y incense and woody quality we got here but why not to add some vetiver to "No Vetiver"? and what about throwing in a tad of leather as well? 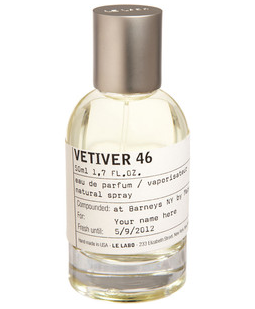 Vetyver 46 smells great, but be aware that you can have CDG2MAN (which is even better) at 1/3 the price.